The cephalopods are the most evolved class of molluscs. Theis name comes from the Greek cephalos= head + podos= feet. In most cephalopods the shell is much reduced or even absent. Their foot has been modified into eight, ten or more prehensile organs transformed into arms with suckers that have defensive and attacking functions: their tentacles. 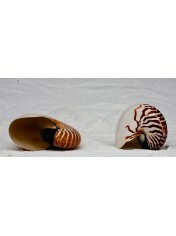 The Nautilus (Nautilus pompilius) is the only cephalopod that still has a true shell.